There have been a thousand and one reviews of this pattern gem. It’s about to be a thousand and twoooo. You see, I finally got around to making the Jalie City Coat and I am 120% in love with it. I really needed a jacket for travel and to casually throw on in the fall season. 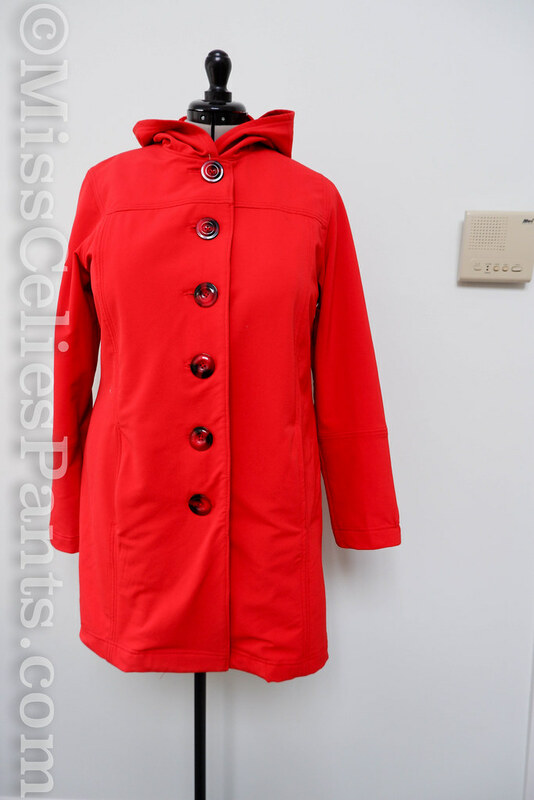 Something waterproof and with a hood ideally for walking the dog or running to the store. 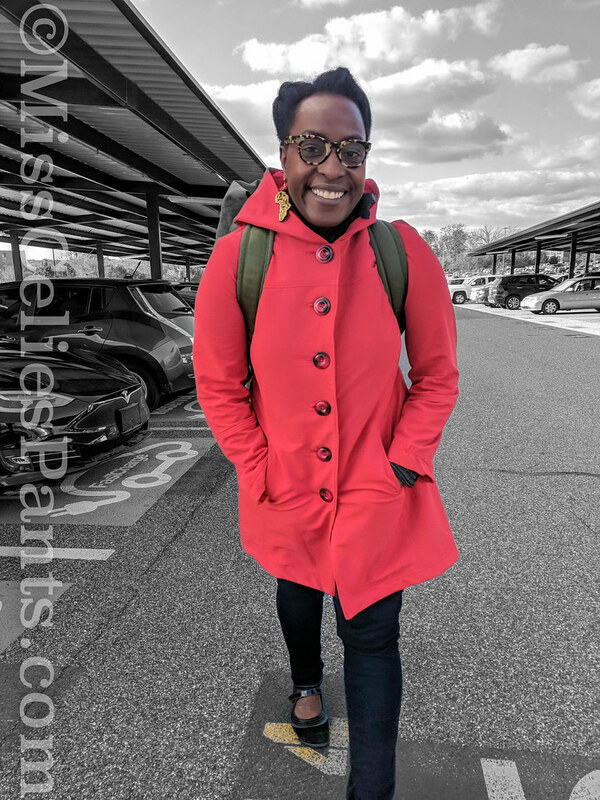 The Jalie City Coat does all those things AND had extremely flattering and easy to adjust princess seams. First, the pattern does call for a low stretch fabric. My soft-shell with merino wool backing from Fabricmart has stretch. But, I managed to cut it with the stretch going lengthwise vs horizontal. After a few panicked messages on the Jalie Facebook group, I was assured from others it would fit. And, it does! My other error made a longer lasting impact. My iron was WAY too hot when I applied interfacing to the front facing. It melted the facing, which caused it to shrink. I had to get ‘creative’ (read, made a mess) with the hem. Which caused some not so great pulling at the front and wonky hem. THIS DOES NOT ABATE MY LOVE OF THE JACKET. Now, on to the good parts! Made a Size Z grading to a BB at the thigh. I did not make a full bicep adjustment and I wish I had. There is about 2″ of ease of me in the jacket. So, when I wear a sweatshirt, there’s no excess ease. A coat needs 4″ of ease. 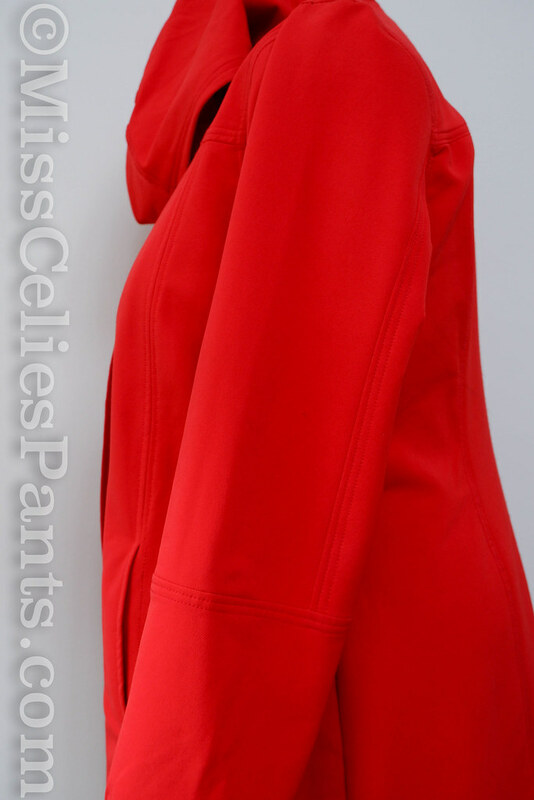 An unlined jacket 3″ of ease. But, I cut out the pattern before I thought about the arms. I don’t think the sleeves are slim. I have larger arms. You’ll notice there’s some fabric drag around the pocket areas. I believe this is because I accidentally cut the fabric with the stretch going vertically instead of horizontally. So, it’s not as stable as it should be. 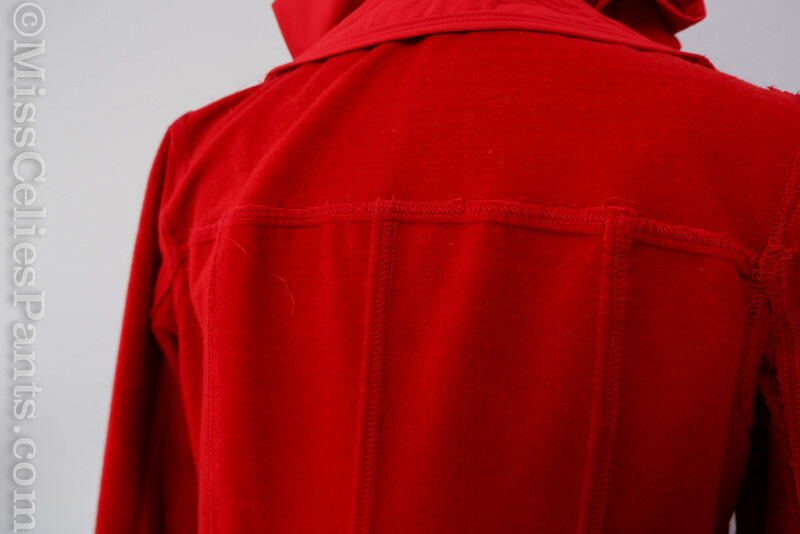 The jacket is drafted unlined. Which I welcomed because I wanted an easier project with less finishing. It also gave me a chance to use my new Brother CV3550 coverstitch machine. In fact, this project was basically my unboxing as it sat in storage while we moved for several months. 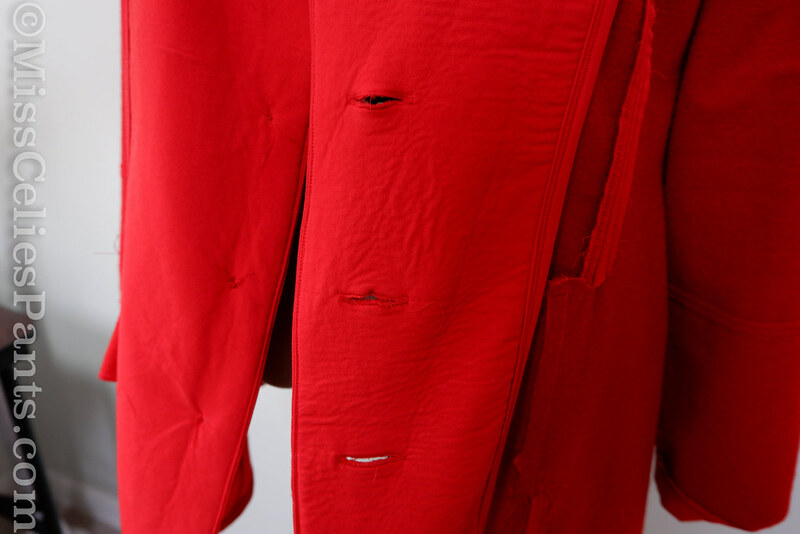 For this jacket, I finished most of the seams with the coverstitch. It provided the topstitching a seam finish in one pass. Using the written directions I wasn’t able to finish the front princess seams in a way that made me happiest. Increase the SA on front and pocket seams to 5/8″ . Then, I’d be able to sew it as directed and go back and coverstitch for the topstitching. OR serge the front panels first and then topstitch. 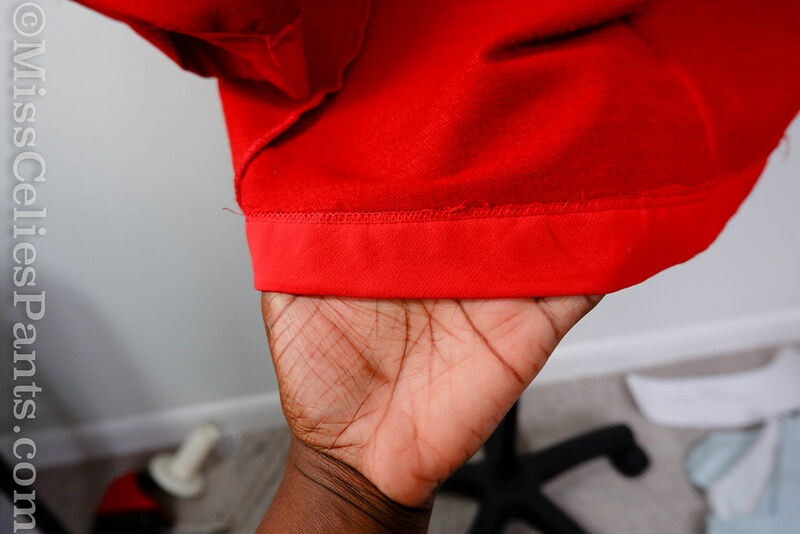 You could also add 1/4″ to the pocket seam and french seam them for a neater finish. Make the side seams 1″ SA to allow letting out later on. I’d add a little walking ease. Serge the pockets or sew them as french seams, maybe bind the pockets? Speaking of binding, I used my binder attachment on my coverstitch to finish the facings. Interfacing is optional in the facings and I used it. I’m glad I did as I think it helps provide support for the buttonholes. Finally, hemming was also done on the coverstitch. This whole project took a little longer than I’m used to with sewing. For those who aren’t on Instagram, we moved about two months ago. We haven’t sold our old house yet (more stressful than I anticipated) and I have unpacked the bare minimum for my current sewing room. There’s a lot of work that needs to be done in my sewing room starting with hardwired lights. But, that’s a big financial project and we haven’t sold our other house yet, lol. I also started this project a few days before I had an easy, outpatient surgery to remove endometrial tissue from my abdomen/navel area. I’d been extremely uncomfortable for six months (trouble standing upright, not being able to sleep on my side or my stomach, waking up from cramps and weird pains I can’t even describe, no waistband touching my midsection) and finally went to my doctor for an endometriosis diagnosis and scheduled surgery. I was told the recovery would be brief, “back on your feet in hours”. And I was in fact home and in bed for a week. I’m also off of strenuous, core exercises and weightlfitng until the new year for fear of causing a hernia. The point I wanted to make on endometrios is listen to your body and go to a doctor when something doesn’t feel right. I shouldn’t have waited five months. I had no clue it was that or that there were some treatment options available to me. I feel much much better now and am working to keep it under control. Whew. I wrote a lot more there than planned. Next post: just sewing 😉. I made some red linen pants for our warm Thanksgiving mini break that I want to show you. Great jacket! I will have to try this pattern with your adjustments. Great coat/jacket. What a lovely bright pop of colour. I bet it cheers you up just wearing it on a grey day. Jacket is lovely. Do not even notice the oops onfront until you brought it up. Glad you are feeling better. Endom is a wicked frustrating painful thing. That is the best description I have heard for it, “wicked frustrating painful thing”. Tanks, PE​geth! OH, I meant to say feel better as well. DOH I had a radical hysterectomy for endometriosis, and I am glad your problems have been resolved with a smaller procedure. Even at that, I felt better quickly, and I hope you do as well. Wow! Everything happened so quickly I didn’t feel like I did as much research as I should have. But, I feel lucky that it was treatable (so far). Thahks for sharing that with me. I hurt from the incisions. But, it was TOTALLY differnt​ (and better) than hurting inside and not being able to do anything about it. Thank you for noticing! I have long inches, but not actual weight, lol. But, after three months of low activity because of a real dumb ankle sprain and now this, I’ll look like the old me in no time 😁 And, thank you for the coat perspective. You’re right, we can be really hard on ourselves. And, thank you for the well wishes on the house! Beautiful coat! Well done! I’m glad you were able to get a quick diagnosis and treatment. I have to admit I’m terribly impatient with recovering after surgery, but in the long run following doctor’s advice is the best thing to do. You look great in red. This is the perfect winter raincoat. Glad that you are feeling better, It’s good advice, to listen to your body. My physical therapist says the same thing about increasing my exercise. It looks great!!! I have had this pattern since my first days of sewing but I still haven’t made it yet—the need for a stretch coating kind of confused me. (I did attempt a version for my niece from a double-sides fleece years ago, but I messed up the pocket attempting to do lapped seams and abandoned it.) I’m glad to hear stretch isn’t absolutely necessary—it looks great!!! I also thought about lapped seams! But, I was thinking with the 3/8 seam allowance they’d be too skinny for me. But, you’re right. The pockets are a little tricky with finishing nicely. Beautiful! So much helpful info. Thanks for sharing!! Glad you are on the mend, happy belated Thanksgiving! Could you tell me where you purchased this fabric? Sadly, I bought it a couple of years ago from Fabricmart. I wish I’d gotten more! I’ve not seen anything like this before. Love this jacket on you—that first photo is great! Will bookmark this pattern. Glad to hear your health scare is resolving—such a good reminder not to ignore things. Fingers crossed for house sale soon! Great coat. The style and color looks really good on you. 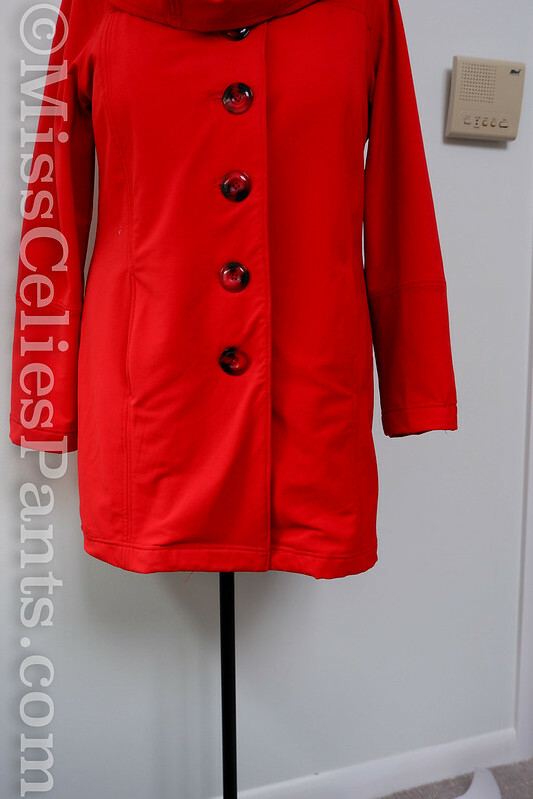 I have been looking for an unlined coat pattern to use with a new to me fabric. A triple layer fabric ( woven water resistant outer layer/weather shield membrane/ fleece inner layer). My fabric seems to have some of the same properties as the fabric you used ..thickness, tricky ironablity, etc. I am seriously considering this pattern based on how well your coat turned out. I want to make this again. I do have the same fabric in black. But, would really love to find something a bit heavier as you describe. The biggest challenge with this fabric was definitely dealing with the seams and having low heat. I really enjoyed this pattern and sewing it. The only changes I’d really make is how I finished the front princess seams. that color is amazing on you. So Cute! I was rush sewing prior to a vacay and did the same thing re: stretch direction on a turquoise denim jacket. 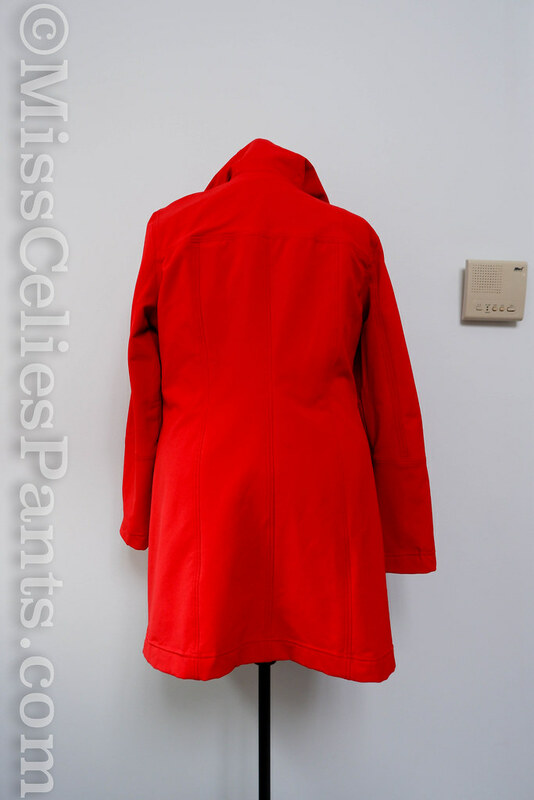 and on mine I can’t really wear as I can move my arms 🙂 Re: jackets with no linings – eek I just can’t understand them – I know it’s my issue but doesn’t it stick to everything underneath when you put on/off? also I can’t deal with finishing things inside so lining covers everything! and hope you are feeling100% soon take care. I was so sure it wasn’t going to fit. It’s a little snug in the arms. But, that’s me and not the pattern. For this, I like it being unlined because of the stretch factor. I’ve had bad luck lining stretch fabrics. I guess because this is a casual jacket for me, I don’t mind the slight stickiness in the arms. And, I haven’t noticed it riding up on my clothes either. I have become “that person” in my friend/family circle talking about being your own best advocate. You don’t need an MD to know that something is not right with *your* body! I’m glad you got it checked out and are on the road to recovery. I. Love. This. LOL! I have eyed this pattern too and haven’t purchased it. It really does make for a great jacket. And bravo on those coverstitched/topstitched seams! They look fantastic. I asked so many people about how their belly button felt when on their period. Despite EVERYONE telling me they had never had that kind of pain, I’m embarassed to say it still took me months. I couldn’t stand up straight! Glad to hear a little wonkiness does not abate your love for this wonderful jacket. You look terrific in that color! I suppose it’s because we have our noses inches away from every little thing during construction that we can become so ridiculously critical of the results. Some of us (guilty here!) are good at ignoring warning signs and avoiding doctors. Not sure why, but there it is. Glad to hear you got yourself tended to–and hope you continue to heal well. A new house sounds exciting! Sending healing vibes for your complete recovery. Trust yourself. You have a lot of experience and expertise and that includes your body! Absolutely love your post on this make. It’s gorgeous. Now I need to screw up the courage to create. I love this jacket! I have the pattern in my stash and greatly appreciate your comments–they will help me when I sit down and go to work on my own version. Thank you so very much for your instructive post. I hope you’ll soon have fully recovered and are feeling all-over well. Take care!